My love started for dogs when I came home from hospital with my mom as a baby. My father came home with my first dog, a black Cocker Spaniel "Pepe". He was my best friend for 16 years. I started formal training and competitive disiplines at the age of 16 and have done so now for the past 38 years. My passion and love for Labradors started 17 years ago, when I got my first amazing Lab, Fluke, who was bred to be a working gundog. I was interested in starting to compete in Field Trials as well as training her to be an active working gundog. Their wonderful temperament around the home, with people, and the ability and desire to work, have wormed their way into my heart and lifestyle. 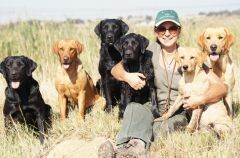 My own Labradors are either Working Gundogs, Field Trial dogs, or both. But most importantly they are my "family". As a dog trainer I believe that all pups need some sort of basic training or if at all possible a higher level of training. What you put in.....gives you more than a 1000 times back. As one will have a calmer, more rounded and obedient dog, in the home and around other dogs. Wildspirit pups need to be part of their family. I highly recommend that they live indoors, this builds up a very special bond, as one will see that they truly love being part of the active family's lifestyle. 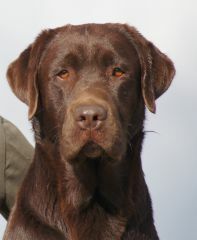 They love to play, retrieve and swim and go for long walks with the family. 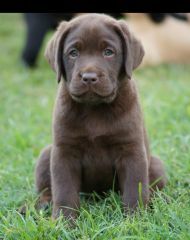 I breed Labradors that are wonderful companion dogs, and they will excel in any other discipline that one might want to start with their canine family member. They are beautiful dogs, but temperament is of the utmost importance. They are great with children, but I have to stress that it is of the utmost importance that parents teach young children how to treat any animal. My pups are whelped in my home and only go down to their puppy "home" at 4 weeks of age. This area very much simulates a "home" environment. ....as their Wendy houses have fans in summer and heaters in winter, as well as having a large grassed area for stimulation with loads of toys. They are raised with tons of TLC and stimulus, as a number of my pups go to working homes. I also start their house training....by starting to teach them to defecate on the grass. 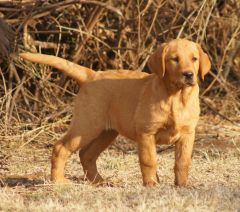 Wildspirit Labradors are based in Centurion, Gauteng. Transport can be arranged to any major airport in SA, or Internationally, at the owners cost. Wildspirit is a registered Affix. Pups are sold with Breeding Restrictions and a Sale Agreement signed by myself and the new owner. All pups are KUSA registered, vaccinated at 5 weeks and dewormed 3 times by the time they are 8 weeks old, they are also micro chipped. They are fed a high quality puppy food. All breeding dogs have been hip/elbow and eye tested and scored. KUSA registration certificates will follow within 6 weeks after the collection of the pup. Puppies are only ready for adoption from 8 weeks of age.